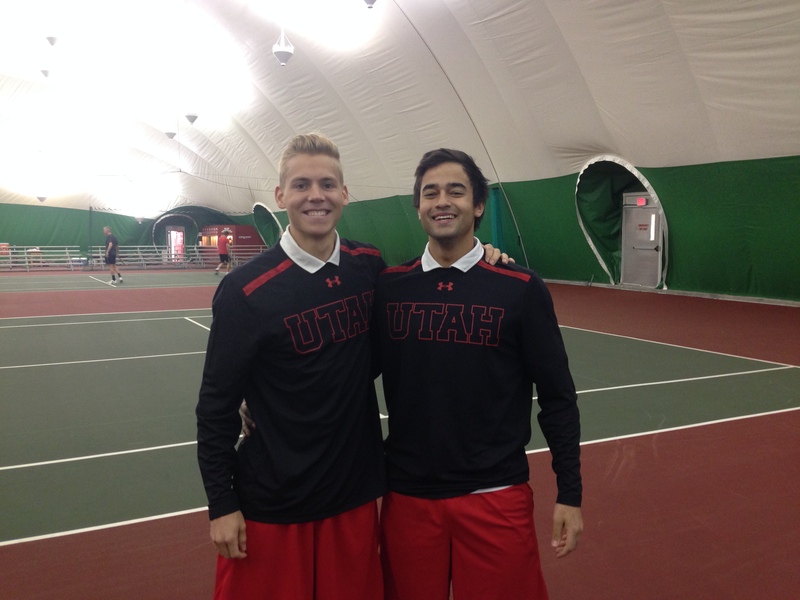 Matt Cowley and Alejandro Medinilla clinched the doubles point for the Utes. The University of Utah men’s tennis team (2-0) beat Cal Poly 4-0, in Albuquerque, New Mexico on Saturday. The Utes will face unbeaten New Mexico (7-0) Sunday at 10am. Utah started the day off well, winning a very closely contended doubles point. With a loss at No. 1 doubles and a win at No. 3 doubles, Matt Cowley and Alejandro Medinilla outlasted Pang/Barber at No. 2 doubles, 6-5(9) in a back-and-forth thriller to put the Utes up 1-0. With momentum on their side, Utah, playing without No. 1 singles player Slim Hamza, won every first set and raced out to a 4-0 victory, with wins by Patrick Mayer, Alejandro Medinilla and Cedric Willems.